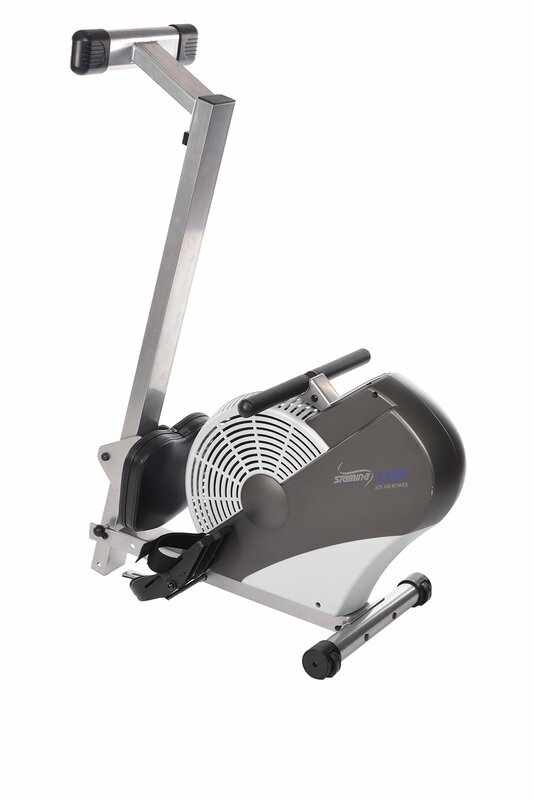 The Stamina Air Rower is a wind resistance rowing machine. Among its features are a padded seat for comfort as well as an inclined seat rail and large footplates; the seat and foot plates are designed especially for rowers who like long workouts. Wind resistance rowing machines like the Stamina Air Rower use a flywheel system that increases resistance when the rower pulls harder. The more force the user applies, the more resistance; this makes for an effective low-impact workout. Wind resistance rowing machines also provide a smoother stroke, which makes the workout feel more like actual rowing. 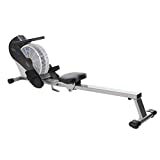 The Stamina Air Rower has been on the market since 2010 and is currently being offered for $299 on Amazon.com. The Stamina Air Rower provides a total body cardio workout, which makes it helpful for weight loss and for toning all of the rower’s muscles. Rowing is a low impact exercise and is therefore ideal for those with joint ailments. Assembly is simple and everything needed comes with the machine. In addition, all the parts are labeled to make them easy to identify. The instructions are simple and easy to follow. This air rower has a small footprint and does not take up much space. The wind resistance mechanism is efficient and makes for a smoother rowing stroke. Users can set the intensity of their workout, which makes the Stamina Air Rower perfect for shared use regardless of each rower’s conditioning. The large footplates and oversized seat make it comfortable for all users regardless of their body-type; there are also foot straps that keep the rower’s feet place. The Stamina Air Rower has a monitor that shows users their speed along with distance, time and the calories they have burned in their workout. The handlebar is textured to make it comfortable in the hands and to help users maintain their grip. The rowing strap is made of durable nylon and can last for years. The seat rail is angled to ensure smooth sliding. This rowing machine is made of steel and is rated for 250 pounds. The Stamina Air Rower Rowing Machine folds up to make storage easier and has built-in wheels; both of these features make moving it easier. It also has floor protectors to keep the machine from scratching floors and from skidding during workouts. The machine comes with a three-year warranty on the frame and a 90-day warranty on its parts. Some users note that the flywheel fan is louder than expected; this should not be a problem for rowers who wear headphones or who watch TV while working out. The machine’s resistance level cannot be adjusted and may not be enough for longtime rowers with advanced conditioning. The Stamina Air Rower’s workout is geared more towards the upper body, so that rowers who seek a more strenuous lower body workout may not be satisfied. A few users have found the incline angle of the seat rail to be too steep and that it makes using the machine uncomfortable. The Stamina Air Rower is worth considering if you want a low impact rowing workout at a reasonable price. High-end gym-quality machines like the Concept2 can sell for hundreds of dollars more even though the Concept2 and the Stamina Air Rower both use flywheel systems to provide resistance. What this rowing machine lacks in a few areas it more than makes up for by providing an effective and comfortable workout in the user’s home. It is sturdy, affordable and can provide owners with years of problem-free use.